Shockolate Vault asks if you want pain or chocolate. Chocolate, please! It's not often I'll judge a game without actually taking the time to play it, but in the case of Shocking Roulette I'm willing to make an exception. If you buy this game, you deserve every minute of pain and torture you receive at its diabolical, unyielding plastic hands. 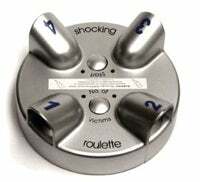 What is Shocking Roulette? Well, you and up to three of your friends (who, I hope the packages warns you, will no longer be your friends once you've made them play Shocking Roulette) put your fingers in the receptacles. Lights spin around, and then randomly, one of you gets electrically shocked. That's it. That's the whole game . It runs for £14.99 and sounds about as much fun as playing Russian Roulette with a semi-automatic. Let me get this straight: I'm going to pay almost $30 (plus, apparently, international shipping) for the same thing I could get at home for free by sticking a fork in the electrical outlet? The product page asks: "When you hear the final beep .. will you be the first to weep?" I like that it implies that you'll only be the first to weep. Just remember: in Shocking Roulette, there are no winners.